Some people enjoy cooking dinner. Others, not so much. But the family feels like they need to eat every day, so we cook every day. Of course, you can always go out, but that gets expensive and takes even more time. There are meals that take a while to prepare, and some people may not have the luxury of time in the evenings. I love to cook, but the prep part is not so fun sometimes. 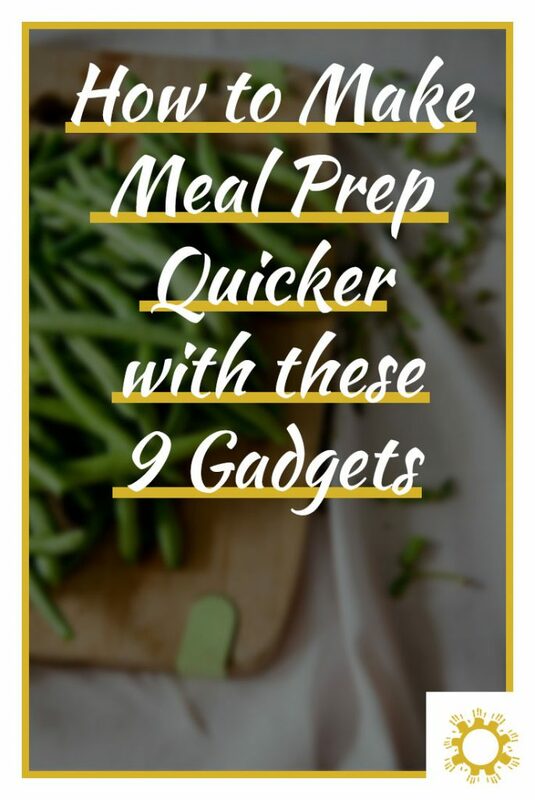 Over the years I’ve accumulated quite a few kitchen gadgets that have really helped decrease the amount of time it takes to get meals ready. I love having my slap chop. It makes it so quick to chop up some of the veggies, and when I chop onions with this, it doesn’t make me cry from it. I have found that these work great with the harder vegetables, such as onions and peppers, but doesn’t work as well with soft ones like tomatoes. I don’t use the mandoline slicer as often as some of my other gadgets, but when I need something sliced thin, this makes it so much quicker. Most of the time, I use this to thinly slice apples or potatoes to make chips. It also has a grater on it which I have used to grate cheese as well as vegetables for making my vegetable fritters. Having an egg slicer is totally a luxury, but it’s perfect for slicing a hard-boiled egg to put on top of salads. If you want a chopped egg, you can slice it one way, then rotate and slice the other so it’s chunked. You could also use it to slice strawberries or other berries as well as butter for biscuits. We use this so much more often than I ever thought we would. When we had lettuce growing in the garden, we were eating salads almost every night. Now that it got too warm to grow the lettuce, we still buy some from the store and make salads often. This salad spinner is great because we can use the inside part as a colander to clean the lettuce, then spin it to help dry the lettuce, and we can store it in the refrigerator in this as well. I haven’t done it yet, but it could also be used for drying other things, such as herbs, kale, broccoli, etc. I was skeptical about this at first. But I absolutely hate peeling and chopping garlic, so figured I would give it a try. Oh my goodness, I wish I had bought this sooner. I got it March of 2015, and that wasn’t near soon enough. This thing is amazing. I don’t have to peel the garlic clove to use it, and it minces it in seconds. So much time saved! When I’m making something that requires a lot of chopping, this thing makes quick work of it. I can use it to chop vegetables, fruit, and cheese. When I make some pico de gallo, it’s so fast to use this to chop everything up, then mix together, and done. Another gadget that I don’t use too often, but when it can be used, it makes a big difference in the time it takes to make a meal. I use it for chopping vegetables quickly, or for crushing up graham crackers to make a pie crust. It can also be used for making things such as hummus. Shredding cheese has never gotten easier. Seriously. I always prefer to buy block cheese and shred it, but it can take so long to do sometimes. The rotary also makes the cheese look so nice for garnishing a meal as well. I bought one of these for Justin for Christmas last year, and we are amazed at how well it works! We love fresh pineapple, but it was always such a pain to cut up. This pineapple corer gets it done in minutes. And it’s cool because it leaves the shell of the pineapple intact so it can be used as a container to put food or a drink inside. The mandarin slicer looks like a cool gadget to have in the kitchen. It could be especially useful when making salads. Oh yes, I hadn’t thought about that! Nice! We have a lot of these and a bunch of good meal prep containers. Meal prep Sunday is real in our house lol we have so much for the week! That’s awesome! I don’t always prep for the whole week, but once my boys start school full time I probably will at least with their lunches. Although I’m not much of a cook but I like to help out. In our kitchen we already have a chopper which we practically use everyday. I would love to have Garlic press, I not only hate peeling, but I hate the smell it leaves in my hands for a long time. I’ll pass this list to my mum, she would love this for sure. The garlic press is amazing! I use it many times per week. Garlic used to be my least favorite ingredient for the same reasons, but now I can have it ready super-quick! You’ve featured so many great product ideas here. I’ve never used a salad spinner but think it might be a good idea. My daughter hates it when I don’t squeeze all the water off of the lettuce after I’ve washed it. I didn’t really think it was necessary at first either, but now I use it every time. The lettuce stays fresh longer since it dries better as well. Omg my garlic press is my fave gadget, I just hate cleaning it! Mine came with a little brush to clean it with that gets in all the small places pretty well. Or you could try an old toothbrush! These gadgets would make food prep quicker and easier. I would be interested to get myself a Mandoline slicer, a Chop Wizard and a garlic press. They are all great tools! I use the garlic press at least 3-4 times per week. Totally awesome gadgets, would make it all go so much faster!! Way cool! Yes, I love how much time these all save!